I’ve found another great use for my phone, recording band practice. Back in the day I had a great Aiwa cassette player that had a dedicated microphone jack that made great recordings. Now that cassettes are gone, I haven’t been able to record band practice. That all changed when Apple released OS3 and the new Voice Memo app. 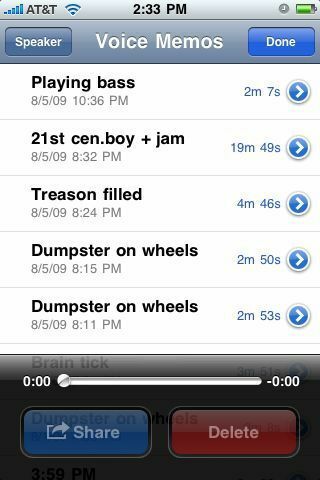 Now I can record band practice on my phone. While this is a great solution for me, I still have two problems. 2.My band rocks a little too hard for the phone’s microphone. Item 1 I can live with. Item 2 I’m in the process of remedying. I want to make a foam shell of some sort to control the noise level. Right the recordings clip pretty hard, but not bad enough that I can’t hear what’s being played. 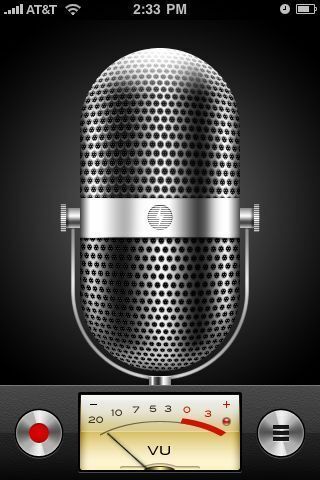 The Voice Memo app makes surprisingly good recordings. If you have any suggestions on sound dampening, please let me know.